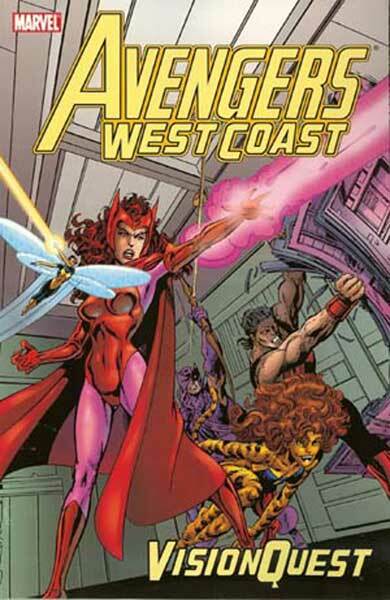 I’m really not sure how it’s possible that I only have one West Coast Avengers trade, as I loved this book in the late ’80s when it originally came out.This trade focuses on John Byrne’s run on the book. There are lots of interesting stuff here: The first appearance of the Great Lakes Avengers, the foreshadowing of Scarlet Witch’s eventual meltdown, and a complete retcon of the origin of the Vision. Plus John Byrne’s pencils were great on this run. I’m definitely looking for more trades from this era ASAP. It didn’t take Marvel long to try to scoop DC’s Geoff Johns up for one of their books, but for some reason the pairing never seemed to click. His run got a LOT of online heat from fans, and proved to be controversial. 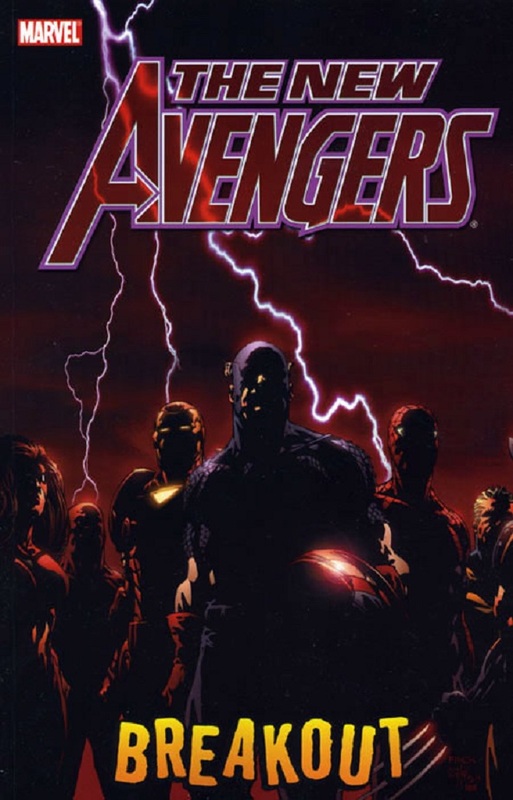 Nothing like what was to come when Brian Michael Bendis took over the book, but at this point, Marvel still hadn’t quite cottoned to the fact that if they wanted the Avengers to become a top-tier book, they were going to need to do some serious changing. So while Johns run is edgier than previous writer’s attempts to reboot the Avengers, it still comes across as slightly forced. That being said, I did enjoy this far more than I thought I would. The “big reveal” of the arc’s villain still comes across as quite hackneyed, and not well-thought out at all, but it’s still quite a good read. Some good character moments between Black Panther and Iron Man as well. There are a few other trades from Johns’ run that I may track down now. So it’s 2004, and Marvel finally realizes that the Avengers are done. Not the concept, but the team as it currently stood. The book had been running on fumes for quite a while, and even bringing in superstar writer Geoff Johns to revive the teams fortunes hadn’t grown any traction with fans. The book was is in the doldrums. Enter Brian Michael Bendis. By this point, Bendis had garnered some serious goodwill among Marvel fans for his runs on Daredevil, Alias, and Ultimate Spider-Man. But he had never really tackled anything with quite as big a potential scope as the Avengers. Could he pull it off? Could he make the Avengers relevant again? From a commercial standpoint, the answer was unequivocably yes. Not only did he make the Avengers relevant again, Marvel essentially rebuilt the entire framework of the Marvel Universe around the work Bendis did on New Avengers. 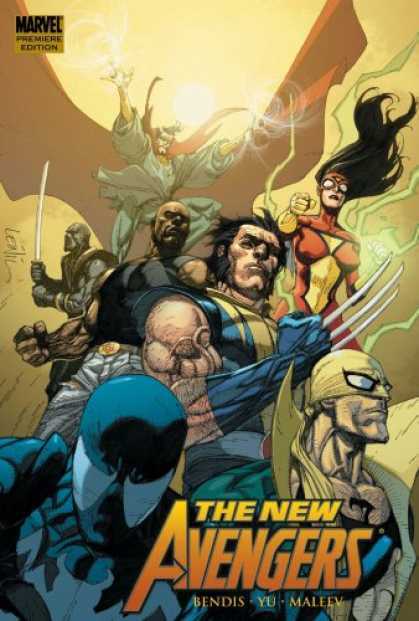 It became Marvel’s flagship book, usurping Spider-Man and X-Men as the top draws at the company. In fact, I would go as far as to say that the title’s success had a large part to do with Marvel realizing that an Avengers movie could work. From a quality standpoint, the answer is a little more complicated. It’s Brian Bendis. Which means the book went from becoming a light-hearted adventure-of-the-week book to a dark, conspiracy-laden, dialogue-heavy, noir thriller. Whether you liked it had a lot to do with how much you liked Brian Bendis’ writing. I for one loved it, and still do. In fact, my appreciation of what he’s done for the book has only increased upon revisiting the work. The first thing Bendis realized is that if he was to make this work, if he was to completely revitalize the very concept of the Avengers, he was going to have to make some tough choices. And so he threw out the baby with the bath water. In fact, he didn’t just throw out the baby, he drowned it at the bottom of the tub. He damaged Avengers Mansion, killed fan-favourite character Hawkeye (and didn’t just kill him, but gave him one of the most ignoble deaths a well-known character has ever gotten, and dismantled the team. Enter New Avengers. The premise here was to organically grow a “street-level” team of some of Marvel’s top characters, as well as some of Bendis’ favourites. And so perennial C listers Luke Cage and Spider-Woman joined team stalwarts Iron Man and Captain America. In addition, he also brought triple A listers Wolverine and Spider-Man into the fold to garner the favour of casual fans. He also threw the Sentry into the mix, just to provide some tension. This doesn’t sound so crazy now, but at the time all of these changes were considered blasphemy, and the changes Bendis brought to the Avengers were probably the most radical since the mid-’60’s. He also provided an opportunity for more casual fans to experience the adventures of their favourites without having to actually follow what was happening in their own books. Even though I love the team, I’m the first one to admit that not only was this not your daddy’s Avengers, it really wasn’t the Avengers at all. The team didn’t have any type of government mandate, almost never went on patrol, and really just stumbled from adventure to adventure. And for me, that was ok. And still is. Those looking for holes to poke won’t have to look far however. While there is some long-term plotting here (the buildup to Secret Invasion, the slow recreation of Luke Cage becoming one of Marvel’s top-tier heroes), and some ideas took almost 4 years to pay off, it does seem as if Bendis viewed what was happening in the rest of the Marvel Universe as somewhat of an inconvenience. The Civil War storyline in particular seemed to take Bendis by surprise, though he deftly brought it into his master plan relatively painlessly. I’ll also never fully believe Bendis’ claims that he had the entire arc of Spider-Woman’s character planned out in advance, as the events of Secret Invasion seemed to fly in the face of reason. And while I happen to enjoy Bendis’ Mametian maelstroms of dialogue, they’re not for everyone, and one of the major criticisms of the book was (and still is) that it’s heavy on exposition, low on action. I think that was a legitimate comment at one point, but Bendis seems to have captured a solid middle ground now, blending character development with action much better than he did at the start of his run. Another critique that is often made of the book is the art. Although David Finch garnered few complaints when he started the book, he handed the reigns over to darker, more stylized artists like Lenil Yu and Alex Maleev, whose work seems to have antagonized long-time fans. Again, this happens to be a matter of taste. I happen to think Alex Maleev is one of comics unheralded geniuses, but those looking for a more traditional, detailed look weren’t happy. For the most part, Bendis’ New Avengers has been a wholly entertaining thrill ride of a superhero comic book. Though not for everybody, I think it’s really set the bar a little higher for what is possible (and also necessary in order to capture a modern audience) with team superhero books in the 21st century. Next up: Wow. More Avengers. Whee. This entry was posted in Comic Books and tagged Avengers West Coast, Brian Michael Bendis, Captain America, Comics, Geoff Johns, John Byrne, Luke Cage, Marvel, New Avengers, Spider-Man, Wolverine. Bookmark the permalink.